It seems that this concern was widely shared, since the Latins were joined in opposing Rome by their southern neighbours, including the Volsci, Aurunci, Sidicini and Campani. “... the men of [the ancient Latin colonies of Setia and Norba] brought tidings to Rome that the Privernates were in revolt ... [The consul Gaius Plautius Venox] marched on Privernum ... [He easily] overcame the enemy, captured Privernum and, putting in it a strong garrison, restored it to the inhabitants but deprived them of two thirds of their territory”, (‘History of Rome’, 8: 1: 12). ✴3 iugera [in the ager Falernus]”, (‘History of Rome’, 8: 11: 13-14). See Saskia Roselaar (referenced below, at pp. 301-2, entry 5 and note 20) for this interpretation of Livy’s description of the respective allotments. “The Campanians, out of compliment to their knights, because they had not consented to revolt along with the Latins, were granted citizenship without the suffrage; so too were the Fundani and Formiani, because they had always afforded a safe and peaceful passage through their territories. It was voted to give the people of Cumae and Suessula the same rights and the same terms as the Capuans”, (‘Roman History’, 8: 14: 10-11). 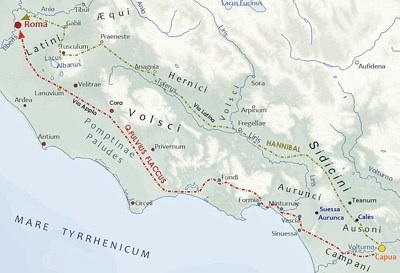 I discuss the settlement of the land south of the Volturnus (around Capua, Cumae and Suessula) where? This was one of the ten ‘colonia maritimae’ that Livy recorded in 207 BC (‘History of Rome’, 27: 38: 1-4) and 191 BC (‘History of Rome’, 36: 3: 3-5). “... a war broke out between the Sidicini and the Aurunci. The Aurunci had surrendered in [337 BC] and had given no trouble since that time, for which reason they had the better right to expect assistance from the Romans. [However,] before the consuls marched from Rome ... to defend [them], tidings were brought that [they] had abandoned their town and ... taken refuge ... in Suessa ..., which they had fortified”, (‘History of Rome’, 8: 15: 1-6). “The following year ... was remarkable for a war more novel than important, to wit with the Ausonians, who inhabited the city of Cales. They had joined forces with their neighbours, the Sidicini, and the army of the two peoples [was defeated] in one (by no means memorable) battle ... However, the Senate [remained concerned about the perennially restive Sidicini] ... They marched on Cales, [which was taken with the help of a Roman prisoner there who managed to escape from his drunken guard. The Romans] then marched against the Sidicini. ... [In 334 BC, while this war was stillin progress], in order to anticipate the desires of the plebs, [the consuls] brought forward a proposal for sending out a colony to Cales. The Senate resolved that 2,500 men should be enrolled for it, and appointed. .. a commission of three to conduct the settlers to the land and apportion it amongst them”, (‘History of Rome’, 8: 16). The Sidicini (like the Aurinci) survived to fight another day. 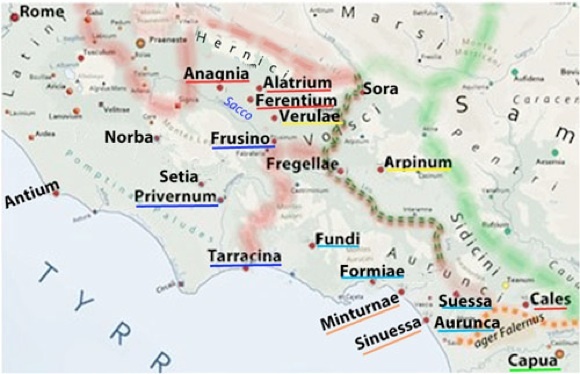 The Ausones had lost Cales, but Livy (‘History of Rome’, 9: 25: 4) recorded their cities of Ausona, Minturnae, and Vescia in 314 BC (see below). “... [since they] are situated in the neighbourhood of the Samnites, with whom our peace is exceedingly uncertain, I should wish that as little reason for animosity as possible may be left between them and us”, (‘History of Rome’, 8: 20: 12). “... the freedom of the state should be granted to the Privernians”, (‘History of Rome’, 8: 21: 10). Thus Privernum presumably became a civitatas sine suffragio in 329 BC. “In that same year, 300 colonists were sent to [the Volscian port of] Anxur where they each received 200 iugera of land”, (‘History of Rome’, 8: 21: 11). Velleius Patroculus (‘History of Rome’, 1: 14: 4) also recorded this foundation in 329 BC, albeit that he refers to the colony by its Roman name, Tarracina. We might reasonably assume that this colony was founded on the land that had been confiscated from Privernum in 340 BC (See, for example, Saskia Roselaar, referenced below, at pp. 300-1, entry 3 and pp. 303, entry 9). ✴colonists that had been enrolled at Tarracina in 329 BC. ✴Henry Armstrong (referenced below, at pp. 171-2 and p. 189) argued that this assignation was initially given only to Roman settlers on the land confiscated that had been confiscated in 340 BC, and that Privernum itself probably received full citizenship shortly before 188 BC, since Fundi and Formiae, which were further from Rome, received citizen at this date (as discussed below). In fact, there is no evidence that Privernum itself received citizenship and was assigned to the Oufentina at a date prior to the Social War. ✴318 BC, when the the level of citizen settlement in the area of the river Ufens was sufficient for the formation of a new tribe, the Oufentina. As noted above, Privernum itself had probably been formally incorporated into the Roman state as a civitatas sine suffgragio only in 329 BC, and it probably retained this status until the Social War. The jurisdiction of the prefect who had his seat here would have encompassed the territory confiscated in 340 BC, and he presumably administered the legal affairs of citizens who had settled there, possibly including the colonists at Tarricina after 329 BC. “Plautius [see above],... after laying waste the lands in every direction and driving off the spoil, led his army into the Fundanian territory. The senate of the Fundanians met him as he was entering their borders; they declared that they had not come to intercede on behalf of Vitruvius or those who followed his faction, but on behalf of the [innocent] people of Fundi ... [They insisted] that they were at peace, and that they had Roman feelings and a grateful recollection of the political rights received [in 338 BC]. They entreated [Plautius] to withhold war from an inoffensive people ... [Plautius duly] despatched letters to Rome, [saying] that the Fundanians had preserved their allegiance ... Claudius [Livy’s source] states that [Plautius] first punished those [Fundians] who were at the head of the conspiracy; that 350 of the conspirators were sent in chains to Rome; and that such submission was not received by the Senate because they considered that the people of Fundi wished to come off with impunity by the punishment of needy and humble persons”, (‘History of Rome’, 8: 19: 9-14). Livy himself was clearly less than completely convinced by Claudius’ record and it is difficult to establish whether the Fundians were actually punished to any extent. As noted above, Fundi received full citizenship under a tribunical law in 188 BC, together Formiae and Arpinum: this programme of enfranchisement is discussed in a separate section below. ✴his eponymous grandson, consul on three occasions in the period 166 - 152 BC. 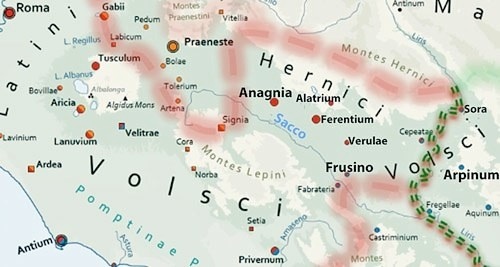 •the Falerna by Cales, a Latin colony founded in 334 BC. Thus, if Fundi had suffered land confiscation and viritane settlement in 329 BC or thereafter, one would expect that these settlers would have been assigned to one of these tribes (probably the Oufentina) and that Fundi itself would have been assigned to the same tribe in 188 BC. However, Fundi was assigned to an old tribe, the Aemila. As discussed below, I therefore believe that the prefecture at Fundi must have been constituted at about this time, when there would have been sufficient Roman citizens in the region to warrant his services. If so then the inscription discussed above would have dated to the period 166 - 152 BC. Like Fundi, Formiae received citizen rights without the vote in 338 BC and was enfranchised and assigned to the Aemilia in 188 BC. However, unlike Fundi, it played no part in the revolt of Privernum in 329 BC, so there is even less reason to believe that it suffered viritane settlement on land confiscated from its erstwhile territory. Had it suffered such confiscation, one would expect that the citizen settlers would have been assigned to either the Oufentina or the Falerna, and that Formaie would have been similarly assigned in 188 BC. 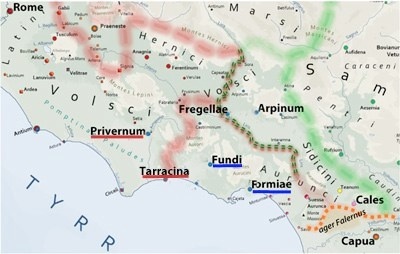 As discussed below, in my view, its assignation to the Aemilia at this points strongly suggests that the prefecture at Formiae, like those at Fundi and Arpinum, was constituted at or shortly after its enfranchisement in 188 BC. “Those [soldiers in it] who declared themselves subjects of the Hernicians, were kept by themselves under a guard. All these, [the consul Fabius Quintus Fabius Maximus Rullianus] sent to Rome to the Senate and [those] that had carried arms on the side of the Samnites against the Romans were distributed among the states of the Latins to be held in custody; ... this gave such offence to the Hernicians, that, at a meeting of all the states, assembled by the Anagnians, ... the whole nation of the Hernicians, excepting the Alatrians, Ferentines, and Verulans, declared war against the Roman people”, (‘History of Rome’, 9: 43: 1). “Calaltia [in Campania] and Sora [on the border of Hernicaian territory] were taken [by the Samnites], together with the Roman garrisons that were stationed there, and extreme cruelty was exercised towards the captive soldiers. ... By this time, an order had passed declaring war against the Anagnians and the rest of the Hernicians and the command against the new enemy was decreed to Marcius [see below]”, (‘History of Rome’, 9: 43: 1). ✴To three states of the Hernicians, (the Alatrians, Verulans, and Ferentines) their own laws were restored, because they preferred these to the being made citizens of Rome; and they were permitted to intermarry with each other, a privilege which they alone of the Hernicians, for a long time after, enjoyed. ✴To the Anagnians and the others [unspecified] who had made war on the Romans, was granted the freedom of the state, without the right of voting; public assemblies, and intermarriages, were not allowed them, and their magistrates were prohibited from acting except in the ministration of public worship”, (‘History of Rome’, 9: 43: 24). ✴The freedom of the state was granted to the Arpinians and Trebulans [usually assumed to be Trebula Balliensis in Campania]. ✴The Frusinonians were fined a third part of their lands, because it was discovered that the Hernicians had been tampered with by them; and the heads of that conspiracy, after a trial before the consuls, held in pursuance of a decree of the senate, were beaten with rods and beheaded”, (‘History of Rome’, 10: 1: 3). In other words, the tribe would have been founded for viritane settlers un the upper Sacco valley. In this scenario, it is at least possible that Anagni suffered land confiscations in 306 BC and that this led to an extension of the Poblilia tribe along southwards along this valley: this would explain why Anagnia, Aletrium and Ferentium were assigned to this tribe when they were enfranchised after the Social War. If this is correct, then Anagni might well have been the seat of a prefect who looked after the legal affairs of Roman citizens who were settled in the Sacco valley. However, despite the view of Adrian Sherwin-White and Robert Knapp (above), there is no evidence that this prefect had any role in relation to the administration of Anagnia. Livy says neither that Frusino was constituted as a civitas sine suffragio nor that it had its magistracy suppressed, either in 306 BC or 303 BC. However, it lost a third of its territory in punishment for the second revolt. Lily Ross Taylor (referenced below, at p. 90 and note 31) suggested that the citizen settlers on this confiscated land were assigned to the Oufentina, which became the tribe of Frusino itself when it was enfranchised after the Social War. It seems to be likely that, like Privernum in 329 BC, Frusino in 303 BC became the seat of a prefect who looked after the legal affairs of Roman citizens who were settled on the confiscated territory after a revolt. ✴Arpinum itself would have shared this assignation 188 BC, when (as noted above) it was enfranchised. In fact, Arpinum was assigned to the Cornelia in 188 BC. In my view, this strongly suggests that the prefecture at Formiae, like those at Fundi and Formiae, was constituted at or shortly after its enfranchisement in 188 BC. This scenario is discussed further below. “Respecting the residents in the municipalities of Formiae, Fundi and Arpinum, Gaius Valerius Tappo, tribune of the people, proposed that the right to vote —for previously the citizenship without the right to vote had belonged to them —should be conferred upon them. ... four tribunes of the people vetoed this bill, on the ground that it was not proposed with the sanction of the Senate, [but] hey gave up the effort [when] they were informed that it was the prerogative of the assembly, not the Senate, to bestow the franchise upon whomsoever it desired. The bill was passed, with the provision that the people of Formiae and Fundi should vote in the tribe called Aemilia and the Arpinates in the tribe called Cornelia; and in these tribes they were then for the first time registered under the Valerian plebiscite. Marcus Claudius Marcellus, the censor ... closed the lustrum”, (‘History of Rome’, 38: 36; 5-6). “No proceedings took place with regard to Scipio, except in the Senate, where all the commissioners and the [two] tribunes spoke in such glowing terms of the general and his fleet and army that the Senate resolved that an expedition should start for Africa as soon as possible”, (‘History of Rome’, 29: 22: 11). “In Rome the censors T. Quinctius Flamininus and M. Claudius Marcellus revised the roll of senators [in 188 BC]. P. Scipio Africanus was selected [by the censors] as Princeps Senatus for the third time]”, (‘History of Rome’, 38: 28: 1-20. “Civitas sine suffragio used to be seen in historiography as an intermediary stage in the process of assimilation of Italian communities to Rome The idea was that Rome first granted citizenship without the vote, so that the community could begin the process of assimilation to the institutions and to Roman culture. However, the only references in the literature to citizens ‘without suffrage’ who [subsequently] received the right to vote ... refer to the citizens of Fundi, Formiae and Arpinum in 188 BC. Something similar seems to have occurred also with the Sabines, whose lands had probably been confiscated by the Romans around 290 BC. C. Those of them who were not killed or expelled probably received some kind of partial citizenship. They or their descendants were probably emancipated in 241 BC with the creation of the Quirina and Velina tribes. However, it is difficult to generalise from these isolated cases. An attentive reading of Livy suggests that the Romans themselves were unsure of when and how the granting of full citizenship could be made, suggesting the absence of a fixed procedure” (my translation from Portuguese using ‘Google translate). “The Samnites and the Paeligni also [complained to the Senate] that 4,000 families had emigrated to Fregellae; and that neither of these places furnished less soldiers on that account. That there had been practised two species of fraud in individuals changing their citizenship: there was a law, which granted liberty to any of the allies or Latins, who should not leave his offspring at home, to be enrolled a citizen of Rome; yet, by an abuse of this law, some did injury to the allies, others to the Roman people. For, at first, to evade the leaving offspring at home, they made over their children as slaves to some Roman, under an agreement that they should be again set free, and thus become citizens by emancipation; and then those men, who had now no children to leave, became Roman citizens. Afterwards, they neglected even these appearances of law; and, without any regard either to the ordinances or to progeny, passed indiscriminately into the Roman state by migration, and getting themselves included in the survey. To prevent such proceedings in future, the ambassadors requested the senate to order the allies to return to their respective states, and to provide by a law that no one should make any man his property, or alienate such property for the purpose of a change of citizenship; and that if any person should by such means be made a citizen of Rome, he should not enjoy the rights of a citizen” (‘History of Rome‘, 41: 8:8).